Philip Klasky for reviewing prior to publication. In the southern reaches of the Mojave Desert, just west of the Colorado River and near the town of Needles, Ward Valley is the traditional homeland of the Fort Mojave, Chemehuevi, Cocopah, Quechan and Colorado River tribes. Six separate mountain ranges form a crown around this high desert valley, where species have evolved in relative isolation. The geographically isolated habitats of Ward Valley and its surrounding mountains harbor surprising biodiversity, including red-tailed hawks, yucca, creosote, screwbean mesquite trees, jackrabbits, kit fox and the 65-million-year-old desert tortoise Gopherus agassizii, which is listed as a threatened species under the U.S. Endangered Species Act. The Mojave people or Pipah Aha Macav (“guardians of the river”) live on 42,000 acres of reservation land ranging across the California, Arizona and Nevada borders. The Mojave and their neighbors, the Chemehuevi (Nuwu) or Southern Paiute, tell stories of a vast trading network they shared with peoples from as far away as the Pacific Coast to the Colorado Plateau and the Sonoran Desert. This history is told through song cycles or “storyscapes” that detail travel routes across massive mountain ranges and broad deserts and, in similar fashion to Australian Aboriginal “dreamings,” tell of the migration of birds, celestial events, and available foods and water along the way. 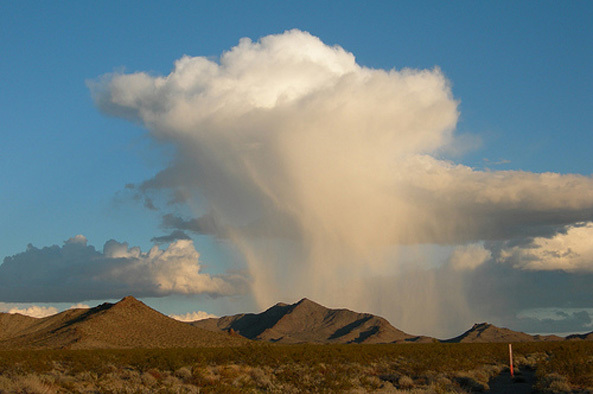 According to some native stories, the sacred Spirit Mountain (Avi Kwa Me), north of Ward Valley, is where the Mojave people originated and where the tribe’s departed souls will rest, having first traveled a pathway through the valley. The desert tortoise is culturally important to the Mojave and appears in the tribe’s clan names, traveling songs and creation story. It was this endangered creature that brought Indian tribes and environmental groups together in their efforts to designate critical habitat for the tortoise and stop the nuclear waste dump at Ward Valley. In 1992 the State of California, under then Gov. Pete Wilson, asked the federal government to sell the state 1,000 acres of land administered by the Bureau of Land Management in order to build a low-level nuclear waste dump. Such dumps are intended to receive items like hospital waste, including radioactive film, and equipment used at nuclear reactors. The dump would occupy some 90 acres, with the remaining land used primarily as a buffer zone. In 1992, shortly before the exit of the Bush administration, Interior Secretary Manuel Lujan agreed to transfer the federally owned land to California, and in September 1993 the state issued a license for the new dump to the radioactive waste-disposal company US Ecology. Public opinion, however, was against the project. Statewide polls showed that 70 percent of Californians opposed the dump, in part due to fears that Ward Valley would become a national nuclear waste repository. Although proponents suggested that most of the waste would be relatively benign, activists argued that the majority of the waste slated for Ward Valley would be highly dangerous byproducts from nuclear reactors and that the so-called low-level waste could contain elements such as cesium, strontium and plutonium, which remain radioactive for long periods of time. Heightening concern was the danger that the waste, which would be buried in shallow unlined trenches, could leak and thus contaminate an aquifer that communicates directly with the Colorado River, 18 miles away, which provides drinking water to some 24 million Southern Californians. Scientists and tribal leaders also cited the devastating impact that the dump—with the potential for radioactive leakage and unavoidable increase in human traffic—would have on the fragile desert, and especially on the desert tortoise. In November 1993, amid growing public outcry, the new interior secretary of the Clinton administration, Bruce Babbitt, rescinded the land-transfer decision, ordering a postponement of further action until the resolution of two lawsuits claiming that the land transfer plan was not in compliance with the National Environmental Policy Act and that it failed to protect the desert tortoise. Babbit also called for further study of the site to address the safety concerns. In late 1994, as a result of legal action brought by the Bay Area Nuclear (BAN) Waste Coalition and others, Ward Valley received federal designation as a critical habitat for the threatened tortoise. In June 1995, after the National Academy of Sciences released a report indicating that groundwater contamination from the proposed dump was unlikely, Babbit conditionally approved the land transfer. However, California refused to accept all the terms, and negotiations reached an impasse. Republicans in Congress took up the Ward Valley issue and tied clearance of the project to a budget-reconciliation package, ignoring protests against the waste site, including those of California Sen. Barbara Boxer. However, the legislation was blocked by President Clinton’s veto, influenced in part by a national citizens’ campaign that brought together Native American, environmental and government watchdog groups and overwhelmed the White House with letters and calls. In October 1995 the Mojave and their neighbors, the Quechan, Chemehuevi and Cocopah, having formed the Colorado River Native Nations Alliance, began holding ongoing religious ceremonies and protests at the proposed dump site. The Alliance and the larger coalition pilloried US Ecology for its poor history with leaking dumps and litigation across the nation, which reinforced fears that nuclear waste would end up destroying the economic, cultural and environmental lifeblood of the desert, the Colorado River. The Alliance hosted several traditional Spirit Runs, where young relay runners from Fort Mojave Reservation ran 30 miles from Ward Valley to the Old Woman Mountains behind the feather-adorned staff of a lead runner. In the first run, participants carried a resolution drafted by the Alliance calling for Clinton and Babbitt to meet personally with the tribal leaders on a government-to-government basis in order to consult with the tribes about the use of their traditional lands. These runs captured tremendous media attention. Environmental groups, including the Ward Valley Coalition, Greenpeace and the BAN Waste Coalition, and the community-action group Save Ward Valley worked with the Alliance to raise public awareness of the issue. In 1996 the Clinton administration, prompted by further concerns over radioactive waste leaks, ordered further geologic testing at the site. Another Congressional bill, which would force the land transfer, failed to reach the Senate floor because of strong opposition from California senators. After extensive study and advocacy by tribes and environmental justice groups, the Environmental Justice Advisory Council advised against the dump; however, the plans were not cancelled and the EPA did not negotiate with the tribes. Meanwhile, litigation over the site continued, with US Ecology and the State of California suing the federal government to force it to turn over the land. In February 1998 the U.S. government ordered the tribes and their supporters to leave the protest camp—which they had occupied continuously since October 1995 and had dubbed “Nobody’s Wasteland”—and attempted to close the site to the public to conduct testing for the movement of radionuclides in the desert region, which was required before construction of a disposal facility could begin. In response to the government’s action, the Alliance and its partners, including the American Indian Movement, led a nonviolent occupation of the camp, keeping seven fires alight as places for people to gather and sing. After 113 days of occupation, the government suspended the testing and rescinded the eviction notice. Ultimately, the coalition of groups succeeded in stopping the proposed radioactive waste dump. In April 1999 a federal judge, in response to the suit filed by US Ecology and California, ruled that Babbit had acted appropriately in rescinding the land transfer to the state. Gray Davis, Wilson’s successor as governor of California, decided not to appeal the decision and ultimately gave up the state’s request for the federal land. US Ecology, claiming breach of contract, filed and subsequently lost a lawsuit against the state. Citing safety issues, the California State Assembly in 2002 passed Assembly Bill 221, which canceled the Ward Valley Project. Every year, the five Colorado River Indian tribes and the Ward Valley Coalition celebrate the victory with a gathering that continues to advocate for the protection of this special place. The Ward Valley struggle is an important example of collaboration between tribal communities and environmental-justice groups toward a common goal. The environmental-justice framework for the campaign asserted Native American sovereignty and human rights and the protection of sacred sites, and served as a critique of nuclear power and the threats to Indian peoples and their lands. To find out more and get involved with protecting and preserving the cultures of the Mojave Desert and Colorado River, check out the Cultural Conservancy and their Storyscape project. To learn more about the struggle to protect Ward Valley, watch “Defending the Sacred,” a documentary film by Tamara Turner distributed through the Mohave Cultural Preservation Program and Greenaction; contact Greenaction for more information. Check out Healing Ourselves and Mother Earth website for photos from the Annual Ward Valley Victory celebrations. To find out more about the current activities of the Bay Area Nuclear Waste Coalition, contact Philip Klasky. California Low-Level Radioactive Waste Site Committee to Review Specific Scientific and Technical Safety Issues Related to the Ward Valley, National Research Council. Ward Valley: An Examination of Seven Issues in Earth Sciences and Ecology. Washington, D.C.: National Academies Press, 1995. Hernandez, Barbara E. “Conservancy brings protection to new acreage.” The Press-Enterprise (Inland Southern California), May 3, 2004. Klasky, Philip M. “Ward Valley: Sacred Homeland, Critical Habitat for a Threatened Species or Nuclear Waste Dump?” Bay Area Nuclear Waste Coalition pamphlet, 1995. Klasky, Philip M. “An Extreme and Solemn Relationship: The Battle Against Radioactive Waste Dumpin in the Mojave Desert.” News from Native California Vol. 9, No. 2, Winter 1995/96. Klasky, Philip M. “Ward Valley: Saving a Storyscape.” Terrain, Fall 1998. Klasky, Philip M. “An Extreme and Solemn Relationship.” Master’s Thesis, San Francisco State University, Geography And Human Environmental Studies, May 1997. San Francisco: Coyote Press. Kuletz, Valeria. Tainted Desert: Environmental Ruin in the American West. New York: Routledge, 1998. Lopez, Steve. “Defenders of the Sacred (Ech Kah Nav Cha Pipah Aha Macav).” Bay Area Nuclear Waste Coalition pamphlet, 1995. Noble, Kenneth. “Environmental War Simmers in California.” The New York Times, Nov. 19, 1995. Noble, Kenneth. “U.S. Delays Opening Site for Dumping Atomic Waste.” The New York Times, Feb. 16, 1996. “Plan to Build Nuclear Dump in the Mojave Appears Dead.” The New York Times, April 4, 1999. Reinhold, Robert. “A Test Case for Nuclear Disposal.” The New York Times, Jan. 24, 1994. Ridder, Chris. “Sacred or profane? Standoff in Ward Valley escalates as protesters are asked to relocate.” GLUE L.A., March 5, 1998. Schine, Eric. “Nuclear waste with nowhere to go.” BusinessWeek, June 10, 1996. Silva, Andrew. “Firm Loses $223 Million Lawsuit Against California Over Radioactive Waste Dump.” San Bernadino County Sun, March 28, 2003. Woodard, Tori. “Resistance on the Ground.” Bay Area Nuclear Waste Coalition pamphlet, 1995. Woodard, Tori. “Riding the War Pony in Ward Valley; Native Americans Occupy Proposed Nuclear Dump Site.” Sonoma County Free Press, March 1, 1998. Wulfhorst, J.D., A.E. Luloff, Stan Albrecht, and Steve Lopez. “Perceptions of Economic Development, Environmental Protection, and Rural Indian Identity.” Journal of Rural Community Psychology E4 (2001): 1-21.